Comcast, one of the U.S.' largest cable and Internet companies, wants to take a novel approach to combat piracy. The company’s big idea is to set up a new system that would send pop-up messages to those attempting to illegally download films or TV programs. The content of the pop-up message would offer the downloaders a variety of options to access the material in a legal way. Currently, the company is trying to band together content owners and ISPs to create a trial run for the pop-up program. Assuming the new effort sees results, the program could become a more widespread thing. According to Variety the new idea would be a supplement to a system some of the major Internet providers are already using called the Copyright Alert System, which Comcast, Verizon, AT&T, Time Warner and other have been on board with since February. That system shoots out “warnings” to users who are infringing on copyright on up to six occasions before the company will limit the user's bandwidth. I guess the idea is that users might make a pirating mistake a couple of times, but that chronic copyright infringers will be punished. Apparently, there have been some debates about whether or not the Copyright Alert System is a legitimate way of identifying and chastising those who pirate entertainment content. Having never seen firsthand the ways these warnings are sent out and attributed to accounts, I can’t totally comment on this, but it seems people are pretty riled up about the issue. Thus, it would stand to reason that Comcast might be looking for an alternative to this new pop-up ad system. Switching one out for the other seems like it should be easy, but it doesn’t seem to be the case. 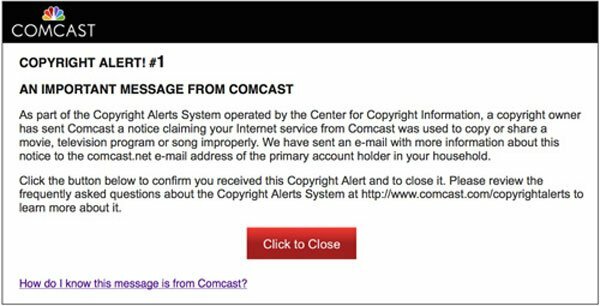 Instead of acting as a replacement, Comcast’s new system will reportedly act as a complement to the Copyright Alert System. So not only will users' bandwidth be messed with if repeated pirating is attempted, but users will get plenty of annoying ads telling them why they are being jackasses for pirating content, as well. Though the scheme hasn’t totally been agreed upon, yet, the company is currently in talks with film and TV studios along with the other big Internet companies to make this thing happen, which means the new program has a good chance of hitting the Internet sometime in the future. The new system seemingly seeks to educate users on how they can access entertainment more effectively (and legally), even if they aren’t cable subscribers or don’t live in an area where movies are wildely available. As has been noted many times before this post, piracy is often motivated by availability. Companies have tried a variety of options, including trailers and the aforementioned bandwidth banning, to keep people from piracy, to varying degrees of success. We’ll see if a pop-up ad proves to be the right solution.